There are two types of crows seen in Cuba and only the sound and cries they make can differentiate one from the other from a distance. The appearance and size are similar to one another. 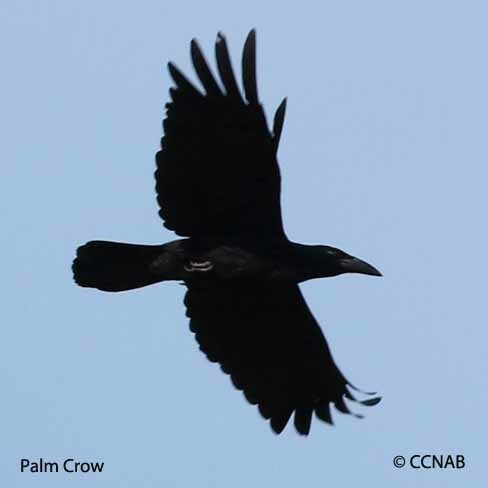 The Cuban Crow has the largest range, whereas the Palm Crow is more local and found along the southern regions of the island. The crows are scavengers and are adept at eating a wide range of foods, including crops such as corn and cereal. They are known for their cunning ways and are perceived as intelligent. They are wary of man because he is their main predator. These birds will not tolerate any type of birds of prey and will taunt and attack them until they leave their territories.